Vince Oropesa holds a myceliated mushroom block. Mushrooms are revered in ancient herbal medicine as a cure-all for everything from colds and flu to cancer. With recent research validating some of this ancient wisdom, a local organic farm is turning native Turkey Tail mush-rooms into medicinal extracts. Half Hill Farm is a small seven acre USDA Certified Organic farm in Woodbury specializing in apples, blueberries, hops and mushrooms. But a recent cancer diagnosis for one of the owner's 72 year old mother made mush-rooms a priority. "Cancer has a way of making you change your priorities and rethink your life routines," said farm co-owner Vince Oropesa. Last year his mother was diagnosed with stage IV lung cancer. Working with her doctors in Murfree-sboro, he began providing her with extracts from a native Turkey Tail mush-room as an adjunct therapy to chemo treatments. "She was at a stage in her health and age where the doctors left it to her whether to go through chemo," Oropesa said. "We take it a day at a time, but she has surprised us and the doctors through ever turn. She's a real fighter." 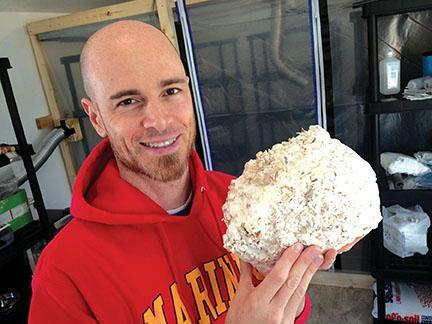 Months before the cancer diagnosis, Oropesa and his husband Christian Grant-ham began building farm infrastructure to cultivate edible mushrooms for local markets. "When we got the news of Sandy's diagnosis, our priorities shifted as well to research on medicinal mushrooms growing in our own back yard," Grantham said. What the farmers found opened their eyes to an opport-unity to not only help Vince's mother, but also many people dealing with cancer and other illnesses. "It was a real wake up call to pay attention to what was literally growing right under our noses," Grantham added. "Life has a way of doing that, and it's up to us how we respond to that opportunity." Turkey Tail (Trametes Versicolor) grows wild throughout Tennessee and the world. The anti-cancer properties of extracted polysaccharides (PSK) and polypeptides (PSP) from Turkey Tail mushrooms are approved cancer drugs in Japan. Private research in America has been limited because pharmaceutical companies cannot patent the results. That has prompted the U.S. government to start funding research.In late 2012, the Food and Drug Administration (FDA) approved a $5.4 million grant to study 4-6 gram daily doses of Turkey Tail mushroom extract on stage IV colon and lung cancer. This comes on the heels of promising National Institute of Health (NIH) research on breast cancer. The funding also follows a University of Pennsylvania study showing Turkey Tail mushroom extracts dramatically increases life expectancy for pets with cancer. "The NIH studies alone showing enhanced Natural Killer (NK) cells and reduced tumor growth in breast cancer patients was enough for us to immediately start Vince's mother on Turkey Tails," Grantham said. Since creating their mushroom extracts, Oropesa and Grantham find interest mostly from people whose illness has them searching for natural alternatives and adjunct therapies. The two say the extracts they are creating on their farm are just as effective as preventative treatment. "We take our extracts everyday," Grantham said. "We do Turkey Tail in our morning coffee and Reishi in our evening tea. We're not doctors, so we try not to talk about how we feel because we don't want to sound crazy, but it is turning into a life-long routine for us." The dual extraction process subjects dried mushrooms to a lengthy hot water and alcohol extraction process that takes a month to complete. The result is a 1:1 concentrated dual extract you can mix into foods or drink. Most of the farm's customers for extracts are people whose priorities have changed due to illness. To bring their medicinal extracts to a larger market, the two farmers are taking a page from the medicinal marijuana industry and are infusing their product in food. "Most people who aren't sick don't quiet understand what to do with our extracts, and that's OK," Oropesa said. "But everybody understands chocolate, and most eat them before we have a chance to tell them how good it is for them." Half Hill Farm offers Spring and Fall workshops on growing your own edible and medicinal mushrooms on oak logs as well as how to make your own extracts. Their mushroom extracts and infused chocolates will be available online soon.